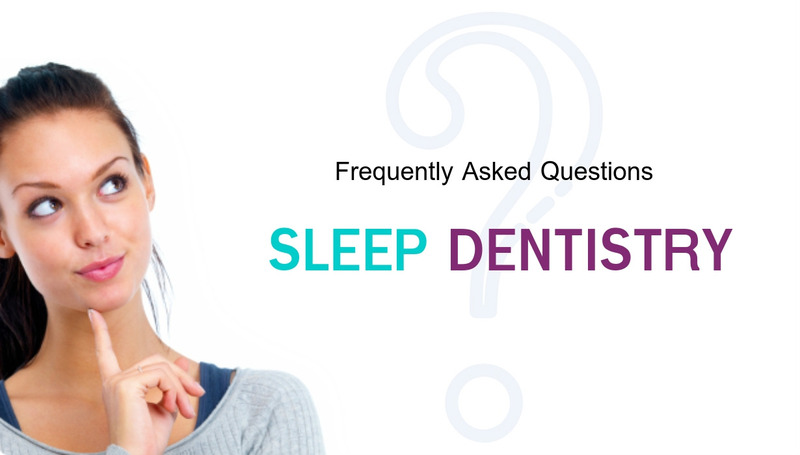 If you are new to sleep dentistry then here at Healthy Smiles, you will find answers to all your questions that are most commonly asked by our patients about sleep dentistry. 1. What is sleep dentistry? Sleep dentistry is more commonly known as sedation dentistry and it is mainly used for patients with phobia’s, anxiety or those having difficulty in staying in a dental chair and coping with dental treatment. After many years of avoiding the dentist mainly because of the aforementioned reasons, patients usually need at least one or two different forms of sedation dentistry appointments in order to get through the dental treatment. Laughing gas (Nitrous Oxide), which usually used to help the patient relax while also being used for anti-anxiety and pain control. Intravenous also known as Twilight conscious sedation. 2. Does it hurt when you have Conscious sedation? And do you remember much about your dental appointment? Sedation Dentistry, often known as conscious sedation or twilight sedation is usually done with a specialist anesthetist with drugs which are generally also used, albeit in higher concentrations, in general anesthetics. These drugs are used in a smaller quantity to make sure that the patients’ safety is always ensured during dental procedures. The use of these drugs usually causes short term memory loss, which then makes it easier for the patient to cope after the surgery, as they have little recollection of the procedure. 3. What are the general costs of sleep dentistry? Sedition dentistry varies in cost depending on the kind of sedition that is used. For example, the most expensive form of sleep dentistry, which is General Anesthetic, involves the cost of the specialist anesthetist, which is roughly between $600-750 per hour and also an initial cost of the operating theatre, if used, which amounts to an additional $700 per hour. Intravenous sedation or Conscious sedation is usually done in the dental rooms under the supervision of an anesthetist and a registered nurse who has special training in advanced anesthesia. The cost of this type of sedation roughly amounts to $600-800 per hour for the anesthetist. There is no additional fee for the operating theatre charged. However, a facility fee may apply for the entire procedure as a one-off. The cost of Laughing gas is varied and depends on the duration of the procedure. This usually amounts to $55 per half hour, including pre and post op recovery. Oral Sedation which is usually done with tablets prescribed by Dental anesthetics prior to the appointment do not incur additional fees other than the consultation fees. Penthrox is now a very common form of anti-anxiety and pain control medication used in dentistry, also known as the green whistle. This usually costs roughly $90-95 per use in one appointment. 4. Who administers the anesthesia and is it safe? The Anesthesia is usually administered by a specialist anesthetist, who is registered with the dental board of anesthesiology and is a practicing specialist usually attached to multiple hospitals. The specialist and his nurse are usually responsible for the safety of the patient, while the patient is being monitored throughout the dental procedure, thus minimizing the risk of advanced complications. Also, during Intravenous anesthesia, the specialist anesthetist makes sure that the patient is co-operative and their cough reflex is completely active. Because the patient is able to cough and swallow during the procedure, this is a relatively safe form of administration of anesthetic drugs. Also monitored by a specialist anesthetist, this is much safer than general anesthetics. 5. What forms of treatment can be done under sleep dentistry? The most common form of treatments, such as advanced surgeries, extractions and teeth removal, implant dentistry, crowns, bridges, fillings, gum treatment along with most other treatments can be done under sleep dentistry. This depends on compliance from the patient, their health and medical history and the duration for which the treatment needs to done. Sometimes, the treatment has to be broken down into multiple appointments and some treatments have to be done after initial procedures, such as gum treatments, which are done to restore the oral health of the gums. 6. Is sleep dentistry for everyone? Sleep dentistry is suitable for most people. It can be done people as young as 16 years to patients as old as 80-85 years depending on the health of the patient. Most patients who have avoided the dentist for a long period of time because of fear can usually undergo multiple procedures such as extractions, fillings, crowns or even implant treatments in one single appointment. It is not uncommon for patients to be asleep for as long as two to three hours with conscious sedation or general anesthetics. Patients with a strong gag reflex, or ones that have fear and anxiety in the dentist or ones having a phobia for needles are very good candidates for sleep dentistry as this reduces the negative impact of any of the negative impact of any of these unpleasant experiences and helps patients get on with their preventive care after their treatment. 7. What are the main benefits of doing sleep/sedation dentistry? longer treatment times, and hence maximum amount of treatment done in one appointment. Sedation or intravenous dentistry can be performed at Healthy Smiles Dental Group, in our own premises, with adequate safety and with the help of specialist anesthetist, hence reducing the need to go to multiple practitioners and going into hospitals for day surgery. To know more about this procedure, please ring us on 98772035 or visit our website www.healthysmiles.com.au. You can also ring us to make a free consultation appointment.